*Discounts are available for multi animal households. 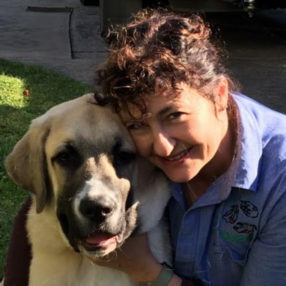 Caroline is Australia’s most recognised and well known Animal Communicator & Craniosacral Therapist, communicating professionally for over two decades. She has successfully assisted thousands of animals of varying species including many of Australia’s native wildlife – bringing understanding between humans and those of other species. Our body has hardware and software. The hardware being the tissue, bone physical matter. The software is the informational patterns that control our functions. Both are required. Two people are talking on mobile phones. ‘Energy’ is what carries the call from one phone to the other. Our voice is the ‘information’ on that signal. The human body field works much the same. By correcting energy blockages AND the information structures of the energy itself, we re-train the body to get back to its innate, intended nature…triggering our body’s powerful built in healing abilities. Animal communication is also known as telepathic communication. It is the experience of receiving direct thought transmissions-images, feelings and concepts- from individuals, including those of other species. Caroline has been communicating professionally with animals for over two decades. Communication is possible with both living and deceased animals. (Read More). CranioSacral therapy is a very gentle, hands-on therapy that works with the body’s own craniosacral rhythm, assisting the body to rebalance itself in a subtle way. As the craniosacral system affects the function of the entire body, working with and rebalancing the craniosacral system can have a profound effect on problems anywhere in the body, leading to significant improvements in health and behaviour in both animals and humans. When combined with Caroline’s ability as an Animal Communicator, the effects of a CranioSacral therapy session can be even more pronounced as she is able to tune in to your animal at a very deep level and to know exactly how and where to work with your animal for the best results. (Read More). *Not available on-site at Qi. Please contact Caroline for more information. He will be yours, faithful and true until the last beat of his heart. “It’s not often that reading a book can change your life completely overnight. This is what happened to me when I was given a copy of Arthur Myer’s “Communicating With Animals”. Before reading this book I was unaware that animal communication even existed. Once I had read it I knew it was what I wanted to do, although I had no idea how to go about it. I wrote to several of the communicators at the back of the book (this was before everyone used the internet! ), and this was the start of my journey into Animal Communication. Caroline Pope was recommended to me by a friend. I was having some serious health and behavioural issues with my pets (Horses and Dogs) that I could not seem to get right. I had tried many different things. Consulting with Caroline helped me to better understand the cause of the issues with my pets so I could implement long lasting improvements. Not only is it her gift that has helped me but her vast knowledge. The most important thing that I have gained from Caroline is to trust your gut instinct; we all have it but having the confidence to trust it is another thing and it is usually more often right than wrong! Veronica, from Western Australia with Shae. In August last year, my 13 year old dog Fonzie (Dobermann X Rottweiler) hurt his back jumping into the car. By the time I got him home he could barely walk and within an hour he was dragging himself around on his front legs-his back legs were completely paralyzed. I took him to the vet and they prescribed anti- inflammatories for him. By morning he was worse and had to be helped to toilet himself-he hated it. His hind legs and in particular his feet were ice cold to touch. Another call to the vet and they suggested I should consider having him put down if there was no improvement. After lots of phone calls and internet searching, a friend suggested Caroline Pope. She has been his guardian angel-we changed his diet and put him on natural supplements-combined with her treatment of him he has made all but a full recovery and is still improving. He is no longer on the anti-inflammatories and as a bonus his hearing and eyesight have also improved. He is now back walking every day and sleeping on the lounge-which he jumps onto, as well as occasionally jumping onto my bed at night. Hopefully by spring I will be able to get him in the car to take him to the river for his swims. Thanks Caroline-couldn’t have done it without you!